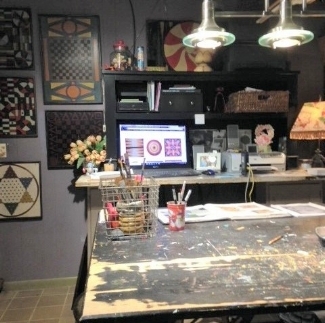 If you are not familiar with "Two Blue Cats" - I would love to have you sign up for our newsletter featuring Annie's amazing rug hooking along with my game boards. We have been putting our heads together for years - you know when you meet that person where you just click? That's us! We're two collaborating folk artists -- Diane Allison-Stroud and Annie Hayes -- who both live in the mountains -- Diane in the Blue Ridge Mountains and Annie in the Catskills (hence "blue" and "cats"). We love each other's work as well as the long, laugh-filled conversations we have as often as our schedules let us. This issue, as always, shows the way coincidence plays a part in this collaboration -- both of us have flower ideas going on in the work we're showing you here. We hope you love what you see here and on our websites -- it all comes from our hearts. Let us know what you think -- we'd love to hear from you. Limited Edition of 10 and then it will be retired. This has been the year of the bird, for me anyway. They just keep popping in my head and I find great joy in making each one different from the last, and full of its own special qualities. They're fun and sweet and mysterious. I love watching them and listening to their calls. Living in the northern Catskills provides a vibrant natural world and I appreciate that. This one-of-a-kind rug, Caddie, is made of a lot of hand dyed wool. A blue and black buffalo plaid that I found a bunch of in Vermont creates iridescence on the wing. The border is wide and uses a method I've developed the past few years of making the corners darker, to emphasize that it's a frame. It follows the beautiful folk art tradition of isolating one tiny branch, having the bird perch on it, and finding ways to add blossoms. 11" high by 13.5" wide and backed with a black and white patterned bias binding. More views here on my site. Below are some shots from my game board studio and my typical Friday night in our small town. Friday night is spent listening to music at "The Jones House", a local community center in our downtown area. It's nice to listen and stroll through downtown meeting familiar faces and enjoying summer surrounded by art and music. My chalkboard is how I keep track of my work - not very sophisticated, I know, but I do LOVE my system! Also a picture of my painting table and my little office nook...and on each side of my computer stool you will find a dog bed, for they want to always be at my feet. To sign up for her monthly newsletter: Go here on her site and click the sign-up text box at the bottom of the page or use the button below. We both periodically send newsletters that offer new work and comments on our process. We think you'll enjoy them, so please sign up and send them along to your friends.